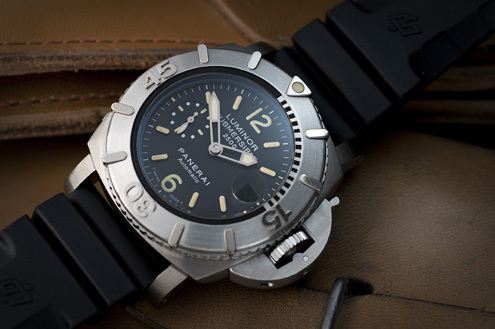 Panerai are known for building watches that have "presence on the wrist". The PAM194 fits in that category without a doubt. Not only is its case 47mm, it's quite thick too. A big and very cool wristwatch for sure. But as it's made from titanium, it is in fact much more wearable than one would think. 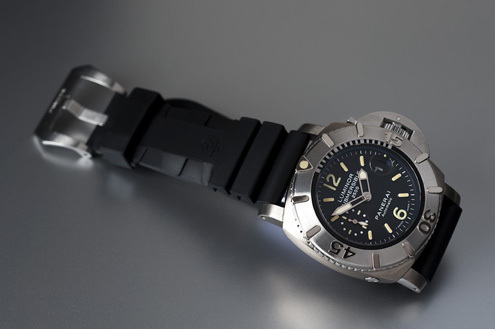 The PAM194 is a Special Edition G series watch (G = 2004). Only 1,000 units were made and the watch was instantly sold out at its introduction. It has a depth rating of 2,500 meters. Most submersibles have a depth rating of at most 300 meters. 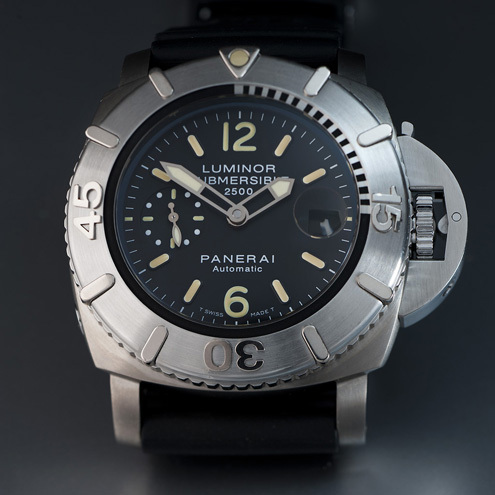 There are exceptions, for instance the PAM243 has a depth rating of 1,000 meters. And also a helium valve like the PAM194. 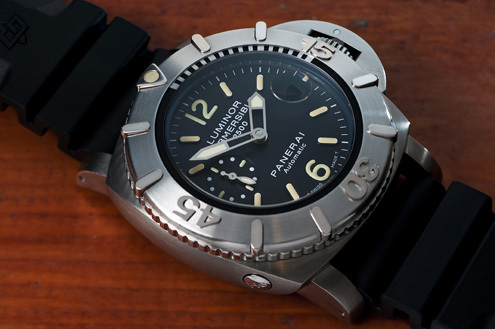 To withstand high pressures when diving, the PAM194 has a sapphire crystal that is a whopping 5.9mm thick. The PAM194 has a 1950's style case as you can see in the above photo (the case is rounded near the lugs). The indices on the dial are Tritium - a luminous substance that is no longer used - and on this particular watch you can see that it's already showing a nice patina (a yellowish discoloration which is unique to Tritium). The watch comes with a 26mm rubber accordion strap. The OP logo is embossed on both parts of the strap as shown in the corners of the above photo. The strap is fitted with a large Pre Vendome style titanium buckle. The PAM194 has the OPIII calibre movement which offers the additional functions date and small seconds. 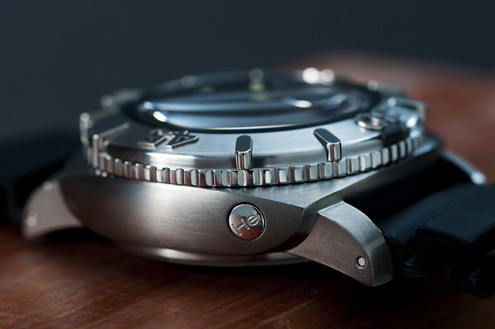 The watch has a solid case back that is also made out of titanium. The only downside is that it is very difficult to read date number because of the cyclops window as we can see from all pictures in this post. Nevertheless, this is fantastic watch, made to perfection, and of course I would like to own. Yes. That's true for most watches with a thick crystal. You can't really read the date when looking at it from an angle.